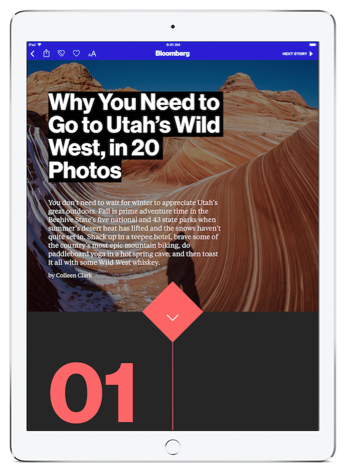 An article created in Apple News Format can include text, images, audio, video, embedded social media, photo galleries, data tables, and interactive maps. You can enhance your article with animations, behaviors, and customized styles that let you create a unique look for your content. Your finished article is processed and rendered in Apple News. With Apple News Format, you only have to author your content once. News automatically optimizes your articles for iPhone, iPad, iPod touch, and Mac to give your readers the best experience for their device. Change the information that News displays about your published article. Information about your article, including author name, creation date, publication date, keywords, and excerpt. A relationship between your article and another Apple News article. Define a layout that supports the look you want for your article. Align article components with columns in your layout. Define the layout of a text component to wrap around another component. The object for defining columns, gutters, and margins for your article’s designed width. The object for defining the positioning for a specific component within the article’s column system. The object for anchoring one component to another component in your article’s layout. The object for defining the space above and below a component. The object for defining the space around the component content on one or more sides. The object for defining the margin above and below advertising components. Understand the types of components that can make up an article. Improve the appearance of the text and components in your article by using Apple News Format styles. The object for setting the background color for your article. Learn about text styles and how to apply them to your text and text components. Learn to use component styles to add borders, set background colors, and apply background images to components and to set the styling for tables. Learn the color names supported in Apple News Format. The strings for defining colors in Apple News Format. Set the layout and frequency of ads automatically inserted in an article, and manually suggest specific locations for ad content. The object for automatically placing components within Apple News Format articles. The object for defining the automatic placement of advertisements. The object for defining properties that affect the frequency and placement with which banner advertisements and medium rectangle advertisements are automatically placed in your article. Define conditions for various objects to get the right look for your content. The object for defining a condition that, when met, causes conditional properties to go into effect. The object for defining conditional properties for a component, and when the conditional properties are in effect. The object for defining conditional properties for a component layout, and when the conditional properties are in effect. The object for defining conditional properties for an automatically placed component, and when the conditional properties are in effect. The object for defining conditional properties for a section component, and when the conditional properties are in effect. The object for defining conditional properties for a text component, and when the conditional properties are in effect. The object for defining conditional properties for a text style, and when the conditional properties are in effect. The object for defining conditional properties for a component text style, and when the conditional properties are in effect. The object for defining conditional properties for a component style, and when the conditional properties are in effect. The object for defining conditional properties for a container component, and when the conditional properties are in effect.